The most mature Wii game to be released yet has finally arrived, but will you miss the childish majority of the Wii's library after you play this game? Slice 'n Dice: The first thing you will notice about No More Heroes is the fact that it's such a bloody, gory, adult game, which is uncommon on the Wii. This is not a game for the kiddies in any sense at all. The story takes place in Santa Destroy, California, with you taking control of newly turned assassin Travis Touchdown. A normal guy that wields a laser beam sword that resembles a lightsaber any day as he kills his way to the top. As you progress through the madness of the game, you will discover an assassin's ranking board. Travis is then thrust into the world of assassins, and pursues his goal to kill all dozen other assassins to become the greatest. Chop Suey: No More Heroes' shining star is its combat, bundled with its over-the-top, outrageous violence. Wielding a laser-beam sword is easier then you'd think in No More Heroes. You are able to attack with either the A button or the B button, with high or low attacks being depended on the way you are holding your Wii-mote. While it sounds simple, the combat will give you a satisfying feel, but won't over work you by making you perform several actions at a time. Much of the charm of the combat is credited to the unbelievable effects that the game shows you. Each time you kill an opponent, they will spray out seemingly endless amounts of blood, and even some coins. Also helpful are the extra weapons that you can purchase (given you have enough coinage). You will be able to purchase other hand-to-hand moves also, giving you an impressive amount of moves to take anyone down. You will also need to pay attention to how much electricity your katana has left. You will be able to find a few power-ups throughout to fully charge your katana, but if you can't find one then you have to press the 1 button and then move the controller up and down repeatedly (take a second to imagine how that looks). Cruising The Town: When you aren't fighting, you can roam about Santa Destroy on your motorcycle in a free-roaming, Grand Theft Auto-inspired manner. You shouldn't expect the kind of freedom that any GTA gives you though. While there are some things to do, the city is mainly a gateway to get to your next mission. That doesn't mean that there's nothing to do outside of combat though. While roaming the city, you will be able to make some purely cosmetic (but still oddly enjoyable) purchases. You will be able to buy new T-shirts, maybe a new jacket if you like. Also, you can even visit the gym to train with a few mini-games and be rewarded with a stronger body. You can also purchase new katanas and upgrades from Doctor Naomi, or videotapes that teach you new wrestling moves from the local rental store. Once you're done shopping, you can perform more side missions for some coins (such as mowing a lawn) or head back to your apartment where you can pet your cat, save your game by sitting on the toilet, (weirdest save ever) or try on your new clothes. Missing Structure: The mission structure is by far the most disappointing aspect of No More Heroes, but its still ok. Generally though, after each boss fight, you only unlock two more missions, and while you can revisit missions as many times as you want, they are all too similar to feel unique. Even though the cores of the missions are similar, there is still variety to be seen. In one mission you may be forced to complete it without taking a single hit, while in another you will only be allowed to use wrestling moves. Also, the crazy side jobs that you need to take before unlocking new missions are intriguing enough to keep you interested. You'll deliver coconuts that apparently weigh a hundred pounds, wash graffiti off of walls, and search the Santa Destroy beach for hidden mines. They're simple tasks, that's for sure, but they use the motion controls well and are just crazy enough to make you wonder what kind of odd job you'll be taking next time. Weak...Or Strong: One of the things that make No More Heroes so unique are the creative graphics. No More Heroes uses a color scheme that employs the use of hundreds of different, vibrant colors all at once. No More Heroes is no powerhouse though. But oddly, the developers seemed to embrace that the Wii isn't the strongest console on the block by making the minimap and health monitor pixilated by design. The menu also looks as though its been taken from the 8-bit era. The style may not gel with everybody but I personally found the graphics to be pretty charming and easy on the eyes! Rent vs. Buy: No More Heroes is undoubtedly a great and very enjoyable title. The unique graphics and the over-the-top, outrageous combat and enemies give the game undeniable charm. 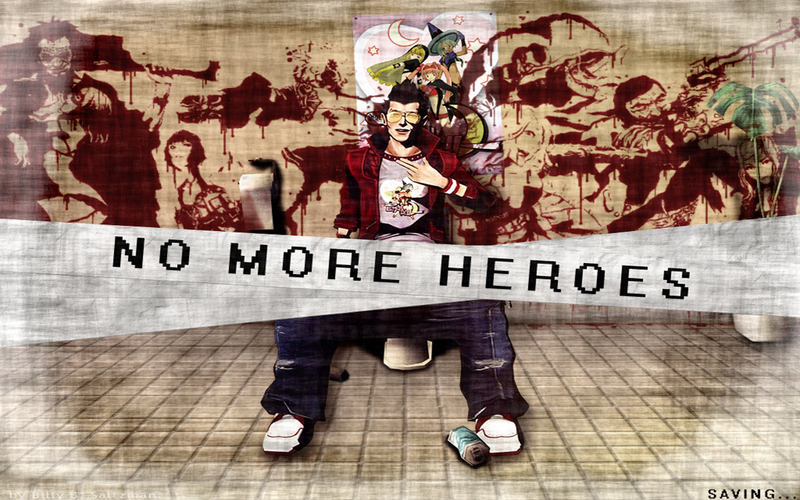 No More Heroes is another instant classic by SUDA-51, and this is a must-buy for anyone craving a little mature action.